At last. 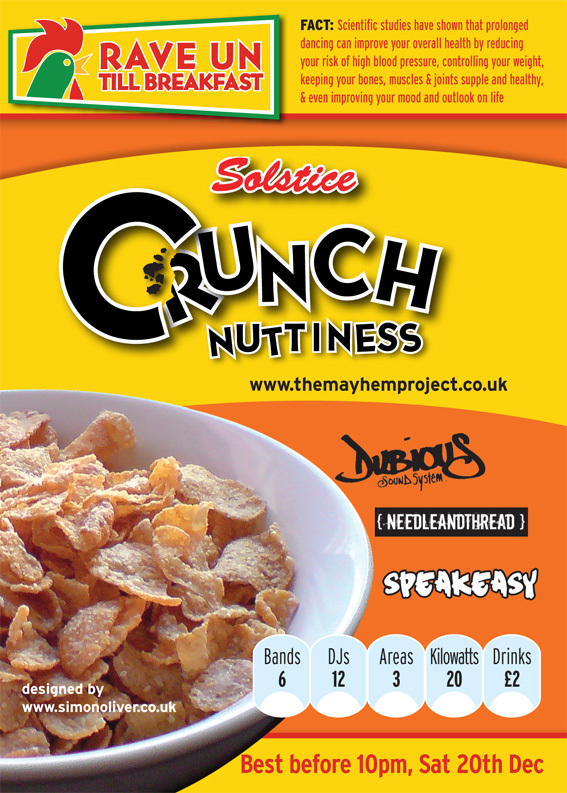 something truly tantalising to get your teeth into..
With its unique, patented blend of fresh bands, crunchy dj’s, and mouthwatering drinks prices, a 9-hr serving of new Solstice Credit Crunch Nuttiness provides an average 200% of an adults RDA, (Recommended Dancing Allowance) if taken as part of a healthy, balanced weekend..
£2 beers, and £2.50 double and mixer providing two floors of excellent nutritional value, in these sour-tasting recessionistic times..
Lots of lovely music for ya’s, live, and otherwise! plenty of the usual shenanigans from the tealeaf collective, and more..
SHEEP ON DRUGS - Old school rave legends back on the scene with new E.P. and more! CHIK BUDO - Beats, Bass, Breaks, and Brass.. very much live.. THE SOUND OF RUM - ExCentral Tempest and live HipHop trio..
ICH - Punk to the Core..
BRETON - Southside chilled rockers..
DJ’s rANdOMoiDz (Adverse Camber) - Eclec-Tech n Bass, with Glitches..
New Orda - Drum n Bass, hard rolla’s..
D*Cyfer - Hard step Jungle..
Rizlateef (Gasman) - Ska-funk, Rock n Rolla’s..
Mr Hovis (NeedleAndThread) - Gyp-Hop, n general eclectication..
9BOB (NYC Downlow) - Disco..
GIDDEON (NYC Downlow) - Reggae an Disco..
BASHMENT BISH (Negusa Negast) - Bashment an Reggae.. 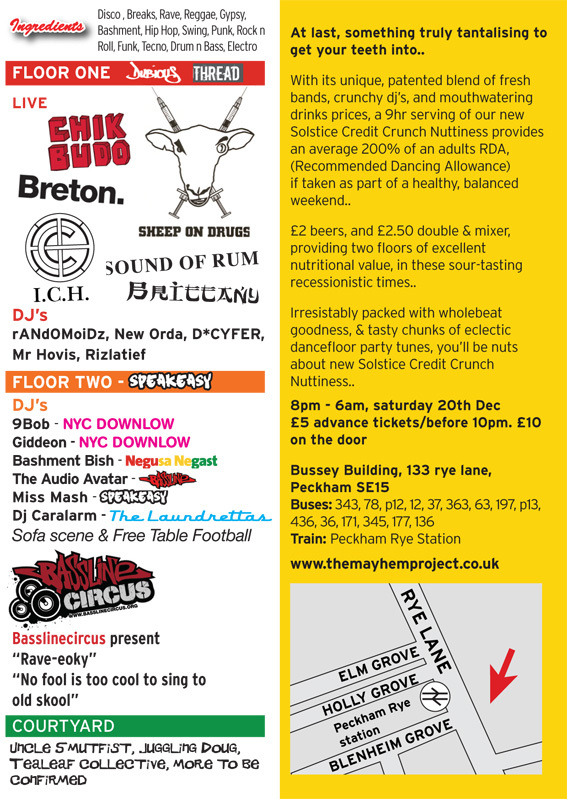 THE AUDIO AVATAR (Bassline Circus) - Nu-Skool Breaks..
MISS MASH (Speakeasy) - Soul, Funk, HipHop, an Rave..
DJ CARALARM (The Laundretta’s) - Swing, Rock n Roll..
With sofa scene, and free Table Football..
BASSLINE CIRCUS (www.basslinecircus.org) presents ‘Rave-eoke’, cos no fool is too cool to sing to old-skool..
UNCLE SMUTFIST (Short Circus) - With his Suitcase o Breaks.. THE TEALEAF COLLECTIVE - Casually de-normalising the situation..
£5 before 10pm, and £10 after..
saturday 20th of december.. doors open at 8pm, live music from 9pm..
We’re in a brand new venue, so this should be pretty exciting..
(the CLF cafe; you might remember it from such parties as the peckham festival), which is 133 Rye Lane, in the heart of pecknam..